DRYLOK® Fast Plug® is a fast-setting hydraulic cement that sets in just 3-5 minutes, preventing water from flowing, even under pressure, through cracks and holes in concrete and masonry structures. It’s ideal for sealing floor and wall joints, patching settlement cracks and holes in masonry walls, and anchoring metal to masonry. Similar to mortar, it sets and hardens extremely quickly. Wear eye protection, rubber gloves, and a dust mask when using DRYLOK® Fast Plug®. The area to be patched should be cleaned thoroughly by wire-brushing, scraping or any other effective process*. Back chisel out the area to be patched to the shape of an inverted “V” (the point at the surface). This allows the patch to expand and lock into the surface. Wet the area prior to patching to help DRYLOK® Fast Plug® cure properly. Both DRYLOK® Fast Plug® and water for mixing should be at room temperature. Mix 3 parts DRYLOK® Fast Plug® and 1 part water thoroughly until you achieve a putty or heavy troweling consistency. This mixture will set in 3-5 minutes. The use of colder water will retard the setting time. Mix only enough for immediate use due to the quick setting time. DRYLOK® Fast Plug® cannot be reworked once it has set. In cold weather, use warm (90°F) water for mixing; also, soak surface with warm water before application. Mix only enough for use in 3 minutes. Discard all leftover mixed patching material prior to starting a new batch. Leftover patching material will chemically react with new material in the mixing receptacle. For active leaks (the presence of flowing water through a break in the surface): mix the appropriate amount of DRYLOK® Fast Plug®. In approximately 2-3 minutes, the mixture will become warm to the touch. This means it is beginning to set. At this time, force DRYLOK® Fast Plug® into the opening with the palm of your hand. Hold it in place for 3-5 minutes to ensure a complete set and bond sufficient enough to stop the flow of water. The patched area may be smoothed and trimmed to the surrounding area in approximately 5 minutes. DRYLOK® Fast Plug® may be painted when set with DRYLOK® Original Masonry Waterproofer , DRYLOK® Extreme Masonry Waterproofer, DRYLOK® Powdered Masonry Waterproofer or DRYLOK® Concrete Floor Paint. For Inactive Leaks, Patching, and Anchoring: thoroughly soak the area to be patched. This will prevent the surface from sucking the water out of the patching material. 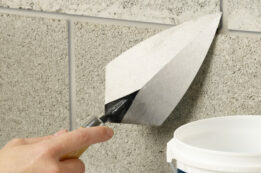 Apply DRYLOK® Fast Plug® with a putty knife or trowel. Use the surface to smooth the patch evenly. When anchoring, chisel or drill a hole in the masonry surface slightly larger than the item to be anchored. Make certain DRYLOK® Fast Plug® is tamped firmly into the hole and around any metal parts. Cancer hazard: Contains Crystalline Silica, which can cause cancer**. **Cancer hazard: Contains Crystalline Silica, which can cause cancer. Risk of cancer depends on duration and level of exposure to dust generated from sanding surfaces or grinding. Use only with adequate ventilation. Do not breathe dust. Avoid eye contact or prolonged contact with skin. Avoid exposure to dust by wearing an appropriate (NIOSH approved) particulate respirator during mixing, application and clean up. Follow respirator manufacturer's directions for respirator use. Close container after each use. Avoid contact with eyes, skin and clothing. Wash thoroughly after handling.